We are very fortunate to live in Manchester, within easy reach of Media City at Salford Quays, the new home of CBeebies, the BBC television station for under 6s. We are huge CBeebies fans, so when my friend Kim sent us the link to join in with their 10th birthday celebrations I quickly put our names down for tickets. I told Joseph a few days before that we were going to see Mr Bloom on Saturday. Joseph gave me that 2 year old going on 12 "yeah right mum" look. On Saturday morning we got up early and started our journey on the tram to Media City. Joseph loves the tram, and even if Mr Bloom didn't materialise, he would have been quite happy. Joseph's suspicion started to wane a little, maybe mummy wasn't lying afterall. At 11am on the dot, out Mr Bloom came. Joseph's face was a picture, his little eyes wide, his mouth open. Mr Bloom sung some songs, and told us how plants grow from seed. He got everyone involved. I was really impressed to see Joseph join in with all the other tiddlers, and do all the actions. At the end he signed autographs and spoke to the children individually. 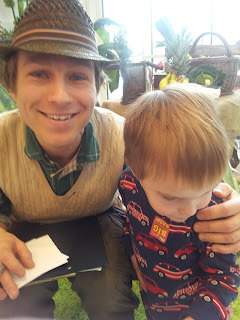 Mr Bloom is just as lovely in real life as on screen, and it was a very enjoyable morning! I managed to refrain from patting his bottom or having a kiss, but a granny in the queue just in front of us jumped on his knee for a big snog! Mr Bloom is the new stay at home mum's bit of crumpet! He's lovely! And certainly a bit more fanciable than Postman Pat! Keep an eye on the BBC audiences website for tickets to events at Media City. This is a non-sponsored post, we won our tickets in a ballot, we love CBeebies! We live in Manchester too, so very excited about the proximity of CBeebies! My friend offered us some spare tickets to see Mr Bloom but we couldn't make it that day which was a real shame. I understand they're going to open up the new Blue Peter garden to the public though, so I'll definitely try to visit that! We also live in Manchester, so excited about proximity of CBeebies! My friend offered us some spare tickets to see Mr Bloom but we couldn't make it which was a shame. I understand they're going to open up the new Blue Peter garden to the public soon, so I'm definitely going to try and visit that! Sad women, if your only aspirations are flicking your beans over Bloom.